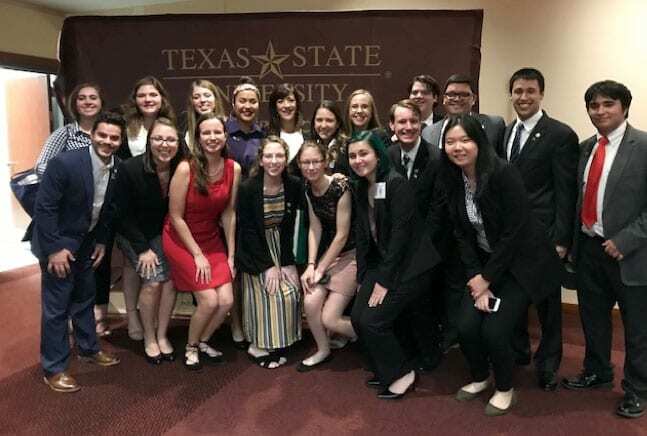 In early November, the Baylor Model Organization of American States (MOAS) traveled to Texas State University in San Marcos to debate policies concerning the Western Hemisphere at the annual Eugene Scassa Mock Organization of American States (ESMOAS) competition. They were joined by students from other universities in Texas, Louisiana and Mexico. This competition marked the 22nd anniversary of the establishment of the model and included an academic conference, a moot court competition and a simulation of the Summit of the Americas. This year, teams at the competition represented 29 of the 35 members of Organization of American States (OAS). The keynote speaker was Her Excellency, Ambassador Maria Paula Bertol, the Argentine ambassador to the OAS. Ambassador Bertol spoke on the importance of public service as an avocation fueled by enthusiasm. She also spoke about the challenges of being a female in a male field. In the summit, Baylor students represented the countries of the Dominican Republic, Haiti and Jamaica. They presented and defended resolutions that covered issues such as reducing the impact of climate change, improving food security, protecting the rights of migrant populations, improving freedom of the press, and creating mechanisms to encourage free and fair trade in the hemisphere. Students also worked on resolving a hypothetical crisis involving a natural disaster in Taiwan coupled with a Chinese invasion. Baylor student Lawson Sadler (junior, University Scholars, San Antonio) served as president of the Summit and chaired the General Committee along with her rapporteur, Liana Dorsbach (junior, anthropology, Boerne). Rafael Silva (senior, international studies, Querétaro, Mexico) and Trevor Allred (junior, international studies, Houston) served as chair and rapporteur for the Secretariat for Multidimensional Security. Camryn Lutes (freshman, history and political science, The Woodlands) was selected to serve on the 2018 Student Steering Committee. Makayla Gorden (junior, anthropology and political science, Midland) won the election for president of the 2019 Model and Jenny de la Fuente (sophomore, Latin American studies, San Antonio) won for Secretary-General. A faculty panel chose Michaela Scott (sophomore, University Scholar, Cape Girardeau, Missouri) to serve as the 2019 parliamentarian and David Bryant (sophomore, history, Waco). Distinguished Team: Ry Hutchinson, (junior, political science, Alvarado) and Alex Rorick, (junior, international studies, Spring). This was the first year Baylor fielded a Moot Court team. Tyler Talbert, a Baylor graduate and local attorney, coached the team. Joshua Hyles, a Baylor History M.A. (2010) served as executive director for the model.